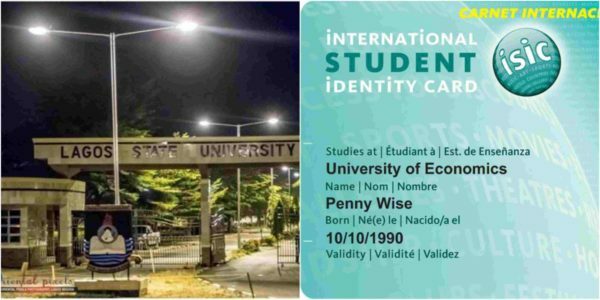 The Lagos State University (LASU) has introduced an International Students’ Identity Card (ISIC) to serve as a valid proof of identification for its students worldwide. According to the News agency of Nigeria, the management of the Lagos State University through the school’s official bulletin stated that registration for the International Students Identity Card commenced on Monday and will end on April 30. The bulletin said that International Students’ Identity Card would give LASU students an opportunity to be part of the largest globally recognized, acceptable and verifiable students’ identity. It says the UNESCO-endorsed International Students’ Identity Card is a passport for reasonable discount on goods and services for students in selected enterprises globally and enables them to pay less on training and courses. “It offers discount on travel, shopping, museum, food, entertainment, transportation, education, among others,” it said. The bulletin said that ISIC also offered scholarship worth 10,000 dollars yearly in partnership with Global Study Awards British Council IELTS and STUDY PORTAL and students registered under it could benefit. In another development, the university has directed its students to swear a court affidavit to be of good conduct. LASU said the directive was issued against the backdrop of poor attitude, m0ral laxity and some negative acts displayed by some students of the institution. “In view of this, all students are hereby requested to submit the sworn affidavit on or before May 15, as failure to comply with the directive by any student will attract sanctions,” it said. The Lagos State University is rated as one of the best state-owned institutions in the country. Graduates of the school have gone ahead to perform outstandingly in many areas of life both within and outside of the country.